Free for all the owners of Motor Strike: Immortal Legends, just update the game!!! 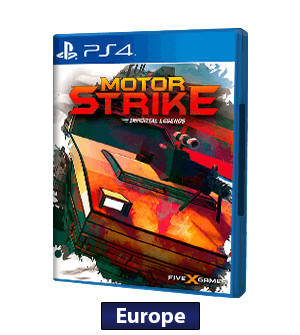 Fast paced action-racing game for PS4 where you will fight with your team in a non-stop bullet and nitro race to reach the winning score before your adversaries. Compete against your friends in a frenzied battle that mixes action and driving as you’ve never seen before! Free of charge, any person with the original game will get it under an update. New Game Mode: Titan Strike. You will fight in five different races where you must destroy the Enemy Titan. Titans are colossus from past ages that were once destroyed and want to be revived. Be the fastest striker to keep your enemies’ Titan dead at all cost!! Destroy the enemy Dreadnought, powerful suborbital defense spaceship designed to protect others. Its only weak spot is that they are awfull defending themselves, so keep that in mind and obliterate them with a rain of missiles!! They say that geniuses leave their legacy, this statement is truer than ever. The devices of Prometheus are still as valid as the day they were made. But be careful: he also know how to protect them! Now you have to run with the prototype aegis shield generator before the defenses kill you! The Aegis shields are up, just keep shooting to destroy them. Do it before your enemy! The Muramasa Combat Drone Station, was abandoned long ago, but it still has a few operative combat drones, be fast and introduce your activation codes!! Not many of them are left and you will need them! The moment of Truth , destroy the enemy Titan and make its core vulnerable. These cores are made of ‘Tesseract’, the key element of the Titans. Without it, they are just a huge pile of garbage. Be fast and annihilate it! New car profiles that modify the car’s stats. Now you can play with your favorite car in a different way! New Weapon. Is there something better than a Gatling?… Yes a Double one!! New drifting system for an improved driving. Strike Back: do you hate the guys behind you? Check this out! A hook, feel like Spiderman! Up to 24 Different tracks in 6 enviroments, or 14 cars. Each one inspired in a different icon, can you recognise them? Customize your gameplay style with the offensive, defensive or specialist trees. Jump into a fast race, or compite in a 4 race event! Team points are the winning condition. Multiple ways to achieve it. No more penalties for being the fastest driver. But you will have to deal with the Minions. Farm them for your advantage. Taste the game with the interactive gameplay. Don’t forget to check the Media section!